Now before you get all excited wondering why I'm reviewing maternity wear, I feel I need to clarify one thing - I AM NOT PREGNANT. I also have no plans to be pregnant any time soon. Pregnant with emotion? Maybe. That's pretty common for me. But certainly not pregnant with a baby. And definitely not with two babies. 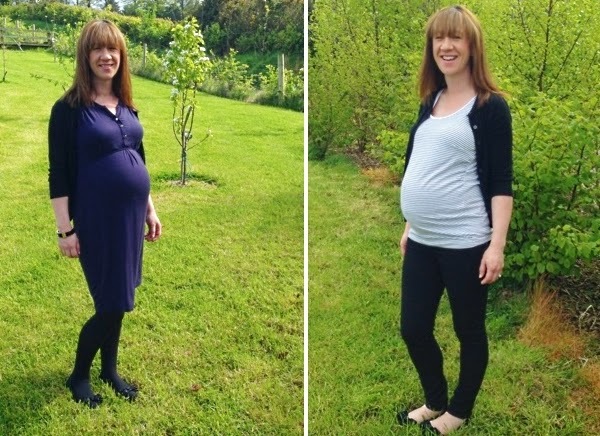 The truth is, Lidl contacted me recently to ask me if I knew any Mama's-to-be that would like to review the new Summer range of Esmara maternity wear in exchange for a bit of new clobber and a blog post from me. As it happens, I have two lovely pregnant ladies in my life - my sister-in-law, Sinéad and my friend, Iseult. I thoroughly believe that all expectant mamas deserve plenty of treats. I also know, all too well, that EVERY expectant mama gets tired of wearing the same few maternity outfits over and over again for months on end. So, how could I say no to being able to score some new clothes for the girls?! Luckily they were more than happy to help me out with a review too, so it's all worked out very nicely. The Esmara collection includes a mix of comfortable, yet stylish, basics which can be mixed and matched to create a complete pregnancy wardrobe. There are Tops, Leggings, Trousers, Dresses and Nursing Bras. Lidl generously gave us some samples of the Tops and Dresses and a pair of comfy trousers for each of them that are perfect for light exercise or relaxing in. Firstly, both of the girls were really impressed by the quality of the clothes. They are well made and cut generously - which is impressive as prices start at only €4.99. They also both said that every item they tried was very comfortable. Sinéad took the road test to extreme lengths and gave everything a wash to see how they'd fare. She was happy to report that they wash very well too. "The pieces are lovely for the Summer as they are so light. Everything is very wearable and could even be worn after the baby is born which makes them a real bargain. Unfortunately, some of the pieces are cut so generously that petite women, like me, might find even the size Small a bit too big!" Iseult was delighted to see that one of the dresses is also suitable for use during breastfeeding. Priced at only €7.99, she felt this was fantastic value. She also loved the vest, which I thought was a great colour on her with her FABULOUS hair, but is also available in other colours. Iseult is a tall and slender size Small and, like Sinéad, she too felt that some of the tops were much larger than she thought they would be. In particular the grey number below, which looked nice and form-fitting on the pack, but was actually a much looser fit in reality. She did, however, think it would make very comfortable nightwear. 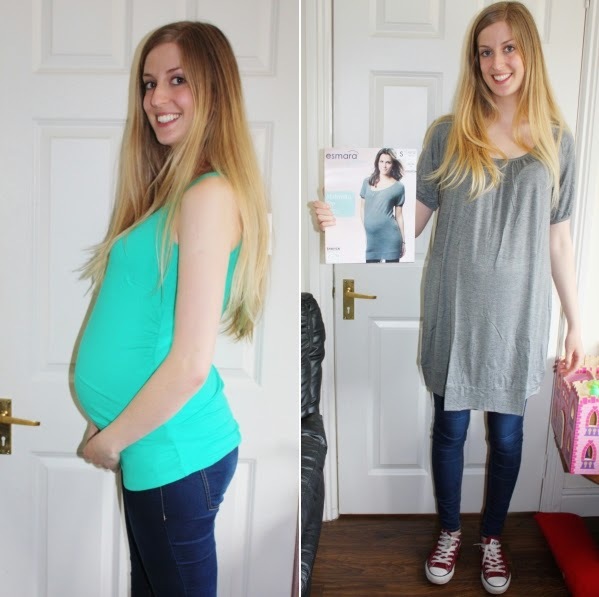 Overall, they were both delighted to get some new items to brighten up their maternity wardrobe and would definitely recommend checking out the Esmara collection. Thanks so much for your help girls - you're both beautiful models! The Summer range of Esmara maternity wear will hit all Lidl stores on Monday May 5th, for a limited time only. 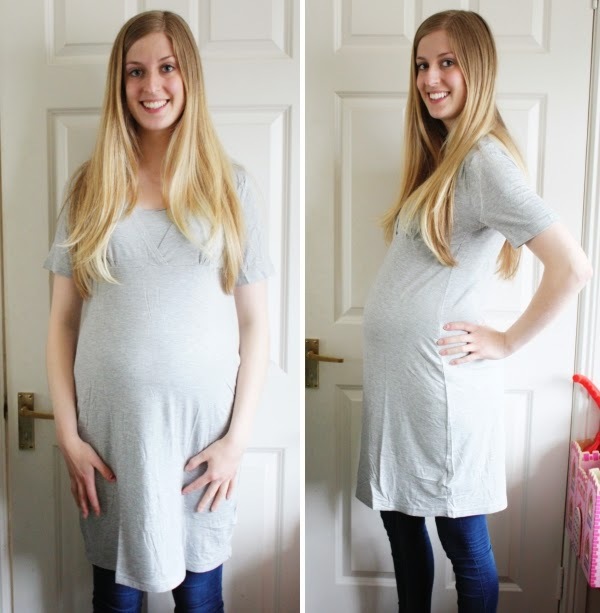 Disclosure: I was given a sample selection of Esmara maternity wear for the purposes of review, by Lidl. All views are my own Sinéad and Iseults and I was they were not paid to give them.